Lucifer may be a grown man, but deep down he's still a little boy. On Lucifer Season 2 Episode 2, we delved into some of Lucifer's mommy issues as he went from being scared of mum to being rather confused about his mother's true intentions. Lucifer's feelings of abandonment are still very raw. As they should be. Being shunned by dad and ignored by mum would make any kid feel bad. While he wants to be mad at mum, what he really wants is explanation and acceptance. He wants to feel that he's loved. If not, he went through a lot of effort to first try to find out if she was lying, and then trying to protect her. Mum might seem like she has nothing but good motives, but it's hard to believe she came to L.A. just to make amends with her son. Cheesy noodles. It's what mothers make to bring their children joy. Permalink: Cheesy noodles. It's what mothers make to bring their children joy. There has to be an ulterior motive, right? She wouldn't have broken out of hell just to tell Lucifer how much she loved him. She could have done that in Hell, even if Lucifer never bothered to visit her. No, I think mum is playing Lucifer. If it was just about Charlotte trying to make up for her past transgressions, then why did dad send him back to L.A. when he was back in Hell at the end of Lucifer Season 1? Maybe mum and dad are just using Lucifer to settle some dispute? Wouldn't be the first time parents used their kids for that purpose. I thought it was adorable that Charlotte made cheesy noodles to try to make Lucifer feel better. That's such a mom thing to do, but also strange for a celestial being. Still give her an A+ for effort. I also enjoyed mum's banter about her meat suit, though Lucifer didn't seem to think it was funny. Mostly he was just trying to figure out what planet his mum was from, because she was acting all sorts of strange. Chloe got in on the mommy drama after Lucifer tried to save her from being a bad mom by buying a doll Trixie wanted. I loved how Trixie tried to manipulate her way into getting that doll by mutilating the one she already had. It did look like something Lucifer would have suggested she do. Trixie is so adorable, even when she's being a bad girl. I loved how Dan can't help but laugh at his daughter's antics. She definitely has him wrapped around her little finger. But, at least he stepped in and tried to be a dad this time around! Lucifer really took to heart what Chloe told him about parenting. And while I liked their interactions this hour as always, I felt a little cheated, because they really didn't spend enough time together. I was also disappointed that Chloe has apparently completely dropped the "trying to find out what Lucifer really is" game. I guess when she threw away that blood sample on Lucifer Season 2 Episode 1, that was really the end of it. Did she really fall for Amenadiel's explanations, or does she just not care anymore? I just find it hard to believe she isn't thinking about the night at the warehouse. Lucifer was dead, and he came back to life with nary a scar, and she's just going to go on with her life like it never happened? Not buying it, people. I'm also having a hard time with the Lucifer CSI angle. I don't like the team gathering in Ella's office to discuss the facts of the case. Every time it happens it's one big hiccup that ruins the flow of the show. While I appreciate Ella's sense of humor, I'm still not liking her around. Her constantly throwing out tidbits about God is odd. And her being involved still feels forced to me. How Chloe and Lucifer were handling cases last season worked perfectly fine. Why try to fix something that isn't broke? 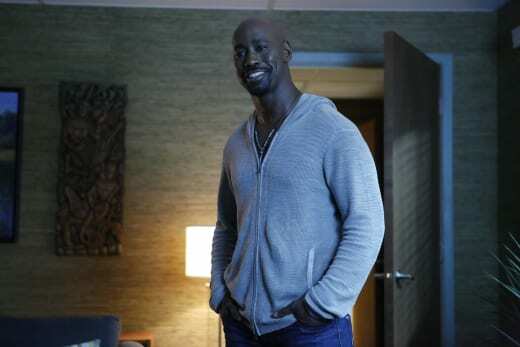 While Lucifer was dealing with his mommy issues, Amenadiel had some issues of his own to deal with. His wings aren't looking too healthy these days, but the big question is why? Are they like that because mom is in town, or because he's being abandoned by dad? I'm not liking how Amenadiel's story is going. Why does he need to lose his wings? If he loses his wings, and Lucifer destroyed his wings, does this mean they are both going to be stuck on earth forever? It's also strange that he hasn't visited Lucifer. They were working together so closely to find their mom, and then all of a sudden they're both on different tracks? I just don't get it. Why can't there be any consistency to their relationship? I'm not exactly sure where Lucifer is headed at this point. This hour almost seemed like a mish mosh of ideas. A little bit of this, a little bit of that, but nothing really solid. I'm curious as to how the show is going to move forward now that it's been determined that mom isn't some psychotic killer and isn't really showing any animosity towards her son. What exactly will her purpose be? What did you think of "Liar, Liar, Slutty Dress on Fire?" Share your thoughts in the comments below. Lucifer Photos from "Liar, Liar, Slutty Dress on Fire"